For GGJ organizers and prospective organizers that are attending the DiGRA conference (http://www.gamesconference.org) this week, we will have a casual meet up. Congratulations to Fukushima Game Jam! Fukushima Game Jam - a great success! Jammers in Minamisoma, Japan supported the recovering Tohoku region after the devastating earthquake earlier this year. 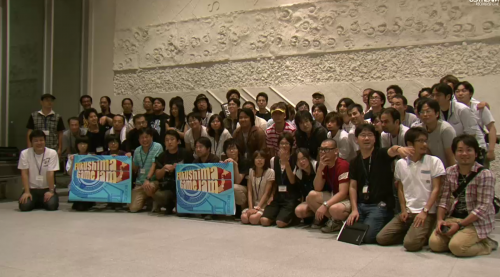 The Fukushima Game Jam took place this weekend, August 27, 28th and was a great success. Eight teams worked together to develop games from start to finish in 30 hours. Organised by IGDA Japan and Ubiquitous Entertainment. The theme for the event was Fun Overcomes Difficulty, and they did show the world that that enthusiasm and energy can do amazing things. The energy of this event shows the world what Japan can do! It's a touch screen phone based console. Petal(player) tries to pollinate the grass, as the ground is decaying on a time limit. The Petal's pollens drop onto the grass, rejuvenate the ground and add color to the world. Elonka LaurieMt. Royal New Jersey, August 15, 2011. The Global Game Jam (GGJ) announced today two new additions to its management team. Laurie Gloge and Elonka Dunin join GGJ as directors, expanding the existing top executive team that already includes directors Zuraida Buter, Foaad Khosmood, Gorm Lai and Ian Schreiber. The GGJ is a project of the International Game Developer’s Association (IGDA). A 2D puzzle game where the player must guide Marcel, the over-confident hamster, by fading parts of the world in and out of existence. When your entire solar system faces destruction by the death of its sun, what will you save? A short exploratory experience letting players take control of a moth's perceptive as you decipher the story behind the scene.